Gusto is a full-service payroll, benefits, workers comp. and HR platform serving over 40,000 small businesses nationwide. Gusto provides solutions for employee benefit plans inCalifornia, Colorado, Florida, Illinois, Massachusetts, New Jersey, New York, Ohio, Texas, and Washington. Gusto is also a completely cloud-based platform that offers software integrations with platforms like Xero and QuickBooks. Learn How You Can Get 1 Month Free on Gusto! ### Tax filing has never been easier! All of your local, state and federal taxes are filed automatically. With the Gusto and Xero integration, you have the ability to automatically account for tax liabilities after each payroll run. Alerts will automatically inform you of important year-end dates. 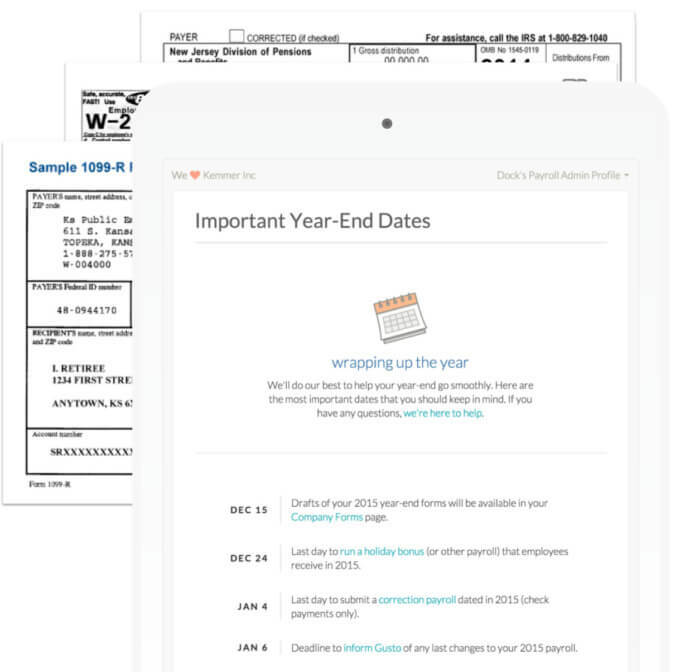 W-2s are automatically filed and available for all of your employees who are in Gusto. Freelancers can easily be paid and 1099s will automatically be processed. 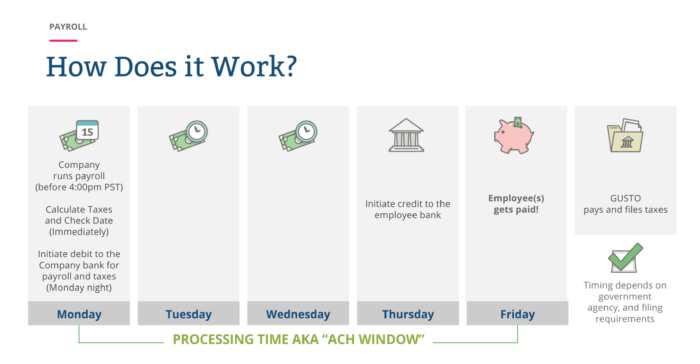 The Gusto platform gives new employees the ability to onboard themselves to your business’ payroll process. Schedule automatic recurring payroll, and never worry about missing paydays. Set up payroll in 8 easy steps! Employees can easily access, download and print their paystubs. Funds for payroll are automatically debited from your company’s account and will be processed in 2-4 days. Off-cycle payroll runs and bonuses can easily be run for as many times as needed! As you probably already know, workers’ compensation insurance is a necessary item to have in place when running a business. You can easily implement policies in the matter of a few clicks. Apply in minutes and receive an instant estimate. Make payments with each pay cycle, instead of one lump sum. Stay updated on federal, state and local requirement changes/additions. Gusto offers a “modern approach” to health benefits with an all-in-one and easy to use benefits platform. Gusto’s smart recommendations help you as a business owner decide which plans best suit your employees. Easy to use employer contribution options. Licensed advisor support is available for employees. A lot of “busy work” comes along with onboarding new employees, paid time off requests, and managing employee data. Gusto allows you to cut down on time spent on these HR tasks. All of your employee data is available on one secure platform. Gusto’s paperless self-boarding process offers e-sign options for new employees and I-9/W-4 storage. Gusto allows you to manage time off requests on a singular platform to automatically track balances and accruals.